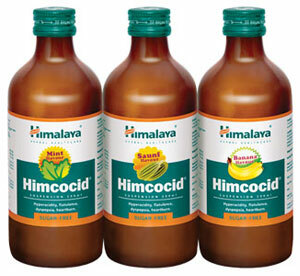 Himcocid suspension is sugar-free and aluminum-free, and therefore, safe for use by diabetics and those with hypertension. 1 to 2 teaspoonfuls (5 to 10 ml) after meals. Pilfer-proof bottle of 200 ml. Available in Banana, Mint, and Sweet Fennel flavors.